Nothing can straighten a scoliosis curve except surgery, right? After considering the invasiveness of such surgeries, patients, or their parents, often seek out alternative forms of treatment in spite of being told nothing else will work. Many are simply looking for hope: Anything that could help their child avoid surgery. Treatment alternatives, such as scoliosis boot camps, have popped up over the past years. Some are claiming amazing results with non-surgical treatment; even treatment without a brace. Patients have been lured in by big promises, encouraged and excited by an X-ray taken immediately following the boot camp, only to find out a year later that their child’s curve is worse than ever. Experiencing such dashed hopes can lead to even greater skepticism regarding the possibility of ever successfully treating scoliosis without surgery. So, what did the study published by Aulisa et al reveal? 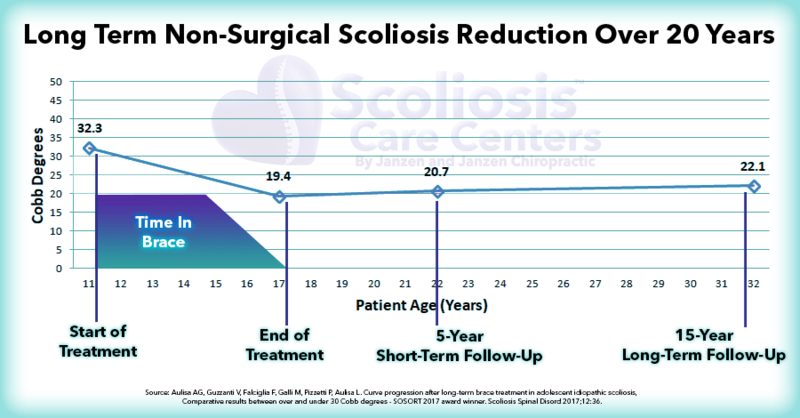 A total of 209 adolescents with scoliosis were studied over a 21 year period, measuring results, on average, 15 years after the end of treatment. The purpose of the study was to determine if correction made to scoliotic curves by brace treatment would eventually be lost after completion of treatment and by how much. In other words, the authors already knew that their brace treatment was making the spine straighter after 5 years.4–6 What they wanted to know was how long these results would last, and how much correction would be lost over time. Only two specialized kinds of braces were studied: The Progressive Action Short Brace (PASB) and the Lyon Brace, neither of which are commonly prescribed braces. Both of these braces are designed in Europe. The Lyon was named after its city of origin in France, and the PASB appears to be an Italian born design. These braces are highly effective at reducing scoliotic curves and are based on the Cheneau design principles. They are nothing like the typical Boston brace, which is prescribed by most orthopedic doctors in the US. Both the PASB and Lyon brace have a strong three-dimensional design, with the ability to correct both Cobb angles and rotational distortion of the spine. The average curve size studied was 32 degrees at the beginning of treatment. Some were as large as 55, and others only 20 degrees. All kinds of curve shapes were included in the study: C-curves such as Thoracic scoliosis, Lumbar scoliosis and Thoraco-Lumbar scoliosis, as well as Double-Major “S” Curves. The average age of the patients at the beginning of treatment was 11 years old and were in active growth phases at the start of treatment (Risser 0-2). Patients wore their brace on average for a full 5 years, keeping them on between 18 to 22 hours a day. Patients were slowly weaned off of wearing their braces as they approached full skeletal maturity. With treatment, the average scoliotic curve was reduced from 32 degrees down to 19 degrees at the end of brace weaning. That’s an average reduction of 40%! After 15 years out-of-brace, an average of 2.7 degrees of correction was lost, basically around 20% of the correction. This means the majority of the correction, or 80% of the correction, was maintained with no treatment at all. 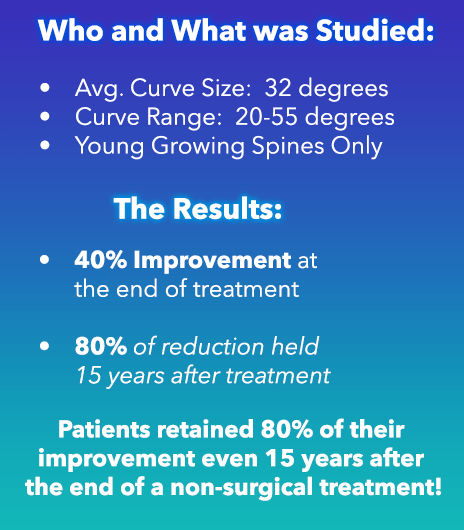 The results are firmly conclusive: A non-surgical brace-based treatment held approximately 80% of its correction for over 15 years after the end of treatment! Why Didn’t Bracing Work For Me? • Love of the Boston Brace. Most orthopedic surgeons in the Western world believe, for some truly mysterious reason, that the Boston Brace is the best brace out there. Over 90% of the Boston Braces that come into our clinic, having been prescribed by another doctor, are either ineffective or making the child worse. The brace uses flimsy, overweight plastic which fails to hold a desired corrective shape against the spine. It is nearly impossible to make a truly corrective 3-D brace design with a brace that closes in the back and uses flimsy plastic. • Quick and Cheap Bracing Protocols. The trend in medicine is toward cheaper and faster. Insurance companies are continually reducing reimbursements for treatments, including scoliosis braces. This has lead to a pressure on the brace orthotic industry to make cheaper and faster braces. One orthotist bragged that they could make a Boston brace from scanning, to design, to fitting in only 45 minutes. The pay is so low for the brace that the orthotist must move as fast as possible to avoid running a negative on the process. • Poor Test & Re-test Practices. Once a Boston Brace is fitted to a patient and they take it home, nobody really knows if it is working correctly. An X-ray in the brace is usually planned a full month after the patient receives the brace. As a result, any problems with the brace design, whether lack of effectiveness or a problem actually making the spine worse, will not be discovered until at least a month later. Once an X-ray is taken, often only the orthopedic surgeon gets to review the X-ray, and not the orthotist (the specialist who makes the brace, not the doctor). So, even if there is a problem, the orthotist who made the brace often does not get the opportunity to spot and correct the problem, nor do they get the opportunity to test with another X-ray, often for fear of over-radiation to the child. • Correction In-Brace. Even the best designed Boston Brace will usually lack the power of a brace like the Lyon, which is made of firmer materials and is much more corrective. In general, the more a brace straightens a spine, the straighter the child will grow. • Time in brace per day. We know from the BrAIST7 study that time in brace matters. The more a child wears it, the better the results. Eighteen hours a day appears to be a minimum cut-off by which true improvement in scoliosis outcome is seen. Sadly, many doctors in Western medicine only prescribe night-time wear. In other cases, because the Boston Brace is so bulky, it may be difficult to convince a child to wear their brace to school, resulting in failure to reach the 18-hour threshold. • Total Years in Brace. Did you catch the average number of years a child was wearing their brace in this study? A whopping five-plus years! Some as many as 7.5 years! This is unheard of in most Western medicine bracing protocols, in which the child is told they can quit wearing their brace even before they are fully done growing. Staying in the brace until the spine has completed growth seems to be a very important key that is being dismissed in Western medicine. • Weaning Protocol. Another important practice observed in this study was that of a gradual weaning of brace wear. Just as an orthodontist will prescribe a retainer after braces come of the teeth, so a scoliosis brace must be weaned gradually. This allows the spine a chance to regain its normal muscular stability and prevents loss of progress, which is common when brace wear is discontinued suddenly. So, we can see that Western bracing practices are full of error, oversight, and missed opportunity. The braces typically don’t reduce the curve well and patients don’t wear them long enough to see long-term results. We’ve observed these problems in clinical practice long before the Aulisa et al study came out in 2017. So we see that both today’s boot camps and bracing practices fall terribly short of their potential. We have set out to change that, which has resulted in the development of what we call the Silicon Valley Scoliosis Method™. Belief in the Boston Brace. For some reason orthopedic surgeons in the US really love the Boston brace, believing it to be the best. Our clinical experience implies otherwise. We custom design each brace, making use of the best of the European 3D designs as well as adding our own innovative design and process. Rather than a Boston Brace, patients receive a 3-D Cheneau-based Silicon Valley Scoliosis Brace. Quick, Dirty and Cheap Bracing Process. Faster and cheaper is the trend in medicine and insurance reimbursements. This has lead to some very quick and ineffective brace output in Western medicine. Never rush a brace. 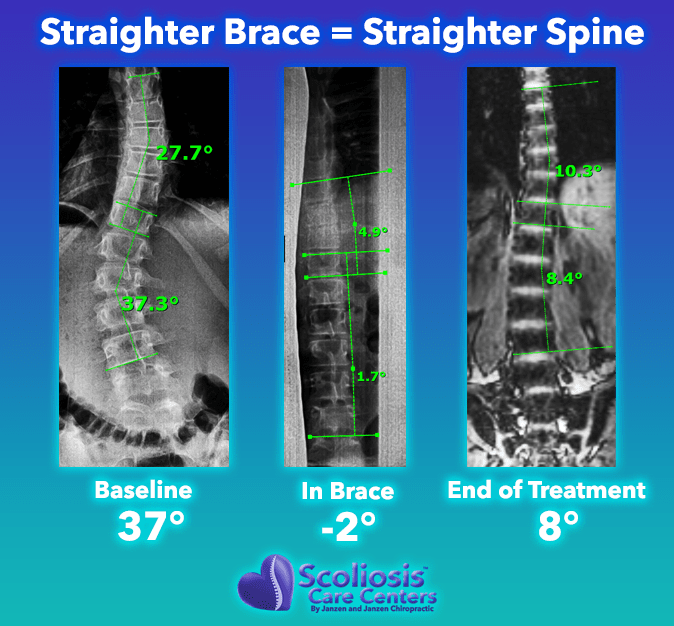 It is the most important part of the scoliosis non-surgical treatment. Rather than a quick 45 minute process, we will spend 3-5 days perfecting the fit of a new brace. Highly determined effort is made to achieve maximum alignment in the brace, as well as maximum comfort. The brace must be perfect! Poor Testing Protocols. Braces are not being immediately tested for effectiveness. Problems with brace fit are either missed or not acted upon. A motivated patient who wears their brace may actually be doing their spine harm! Rather than waiting a month after a brace is fit to measure its effectiveness, we take a standing MRI image in the brace right away. The image is scoured for clues on how to optimize the brace design. Any necessary changes to the brace are also made immediately, then, re-tested with another standing MRI. This process is repeated as often as necessary until in-brace perfection is attained. Lack of In-brace Correction. Western braces often only minimally correct the spine, and sometimes even make the rotation or curves worse! Brace Wear Time Per Day. Falling below the minimum of 18 hours. Many kids don’t want to wear their brace to school. Often the doctors under-prescribe brace wear times. Getting a teenager to wear a brace 23 hours a day can often be tricky. A surprising number of our patients wear their braces full time, at school, and some like to even show it off over their clothes! Making a brace that is trim, light and low-profile definitely helps, but nothing beats the positive encouragement of other kids, their age all experiencing, and enjoying the successful results of having worn their brace. Number of Years In Brace. Brace wear is often discontinued before the end of growth, allowing the scoliosis to, again, grow larger. This is an easy one to address and simply requires an informed understanding that scoliosis is a problem of growth: As the spine grows, it wants to grow more crooked. So, as long as a child is growing, close monitoring with radiation-free standing MRI helps assure we never stop bracing protocols too soon. Lack of Proper Weaning. Quitting a brace cold turkey is often not good and may allow relapse. A gradual weaning process of 2-4 hours reduced brace wear time every 4 months was used in the Aulisa et al study. This is easy to do and during the weaning process, scoliosis-specific exercises can be used to help the spine regain its strength and stability. The Silicon Valley Method, like Silicon Valley itself, believes in innovation and in the “Think different” motto that defines this Valley. We are a Brace-Based Scoliosis Treatment method, combining the best of a scoliosis boot camp with cutting-edge brace technology. Because the method is brace-dependent, long-term results can be expected to last, as both our clinical outcomes and published research are revealing. Hawes M. Impact of spine surgery on signs and symptoms of spinal deformity. Pediatr Rehabil 2006;9:318–39. Lakhal W, Loret J-E, Bodman C de, et al. The progression of lumbar curves in adolescent Lenke 1 scoliosis and the distal adding-on phenomenon. Orthop Traumatol Surg Res 2014;100:S249-54. Aulisa AG, Guzzanti V, Perisano C, Marzetti E, Falciglia F, Aulisa L. Treatment of lumbar curves in scoliotic adolescent females with progressive action short brace: a case series based on the Scoliosis Research Society Committee Criteria. Spine (Phila Pa 1976) 2012;37:E786-91. Mauroy JC de, Lecante C, Barral F. “Brace Technology” Thematic Series – The Lyon approach to the conservative treatment of scoliosis. Scoliosis 2011;6:4.